Oh my goodness, have I been missing Disney!! With Food and Wine going on I am so sad that we don't have passes anymore. We had our "Year-O-Disney" and it was time for a change up, so we got Flo (who I dearly love! ), but oh, I am missing the magic and the wonder... and the FOOD!! Golden Oak Outpost Fry Cart!! Oh my gosh and goodness!! These loaded fries are by far our favorites! Sadly, we didn't discover then until late in our Disney game. We tried to go back to the Magic Kingdom as often as we could as our passes were ending, sometimes just so we could have these yummies. They are also totally man approved, as they were always what Babe would request for lunch. Golden Oak used to only be open for lunch, but we have heard that they stay open later now! We would often share one to tide us over until we got a bigger dinner, but if we wanted to go all out they are still not bad at just around $8 per person! Definitely worth the cost and calories!! We loved them all, but my favorite was the BLT!! Gaston's Tavern Roasted Pork Shank!! This is the perfect meal to split, making the cost right at $5 per person. It is so good and so juicy and also huge! Between the two of us we could barely finish, but don't worry we managed!! And though it does add a little bit to the cost, it is also really hard to pass up the warm cinnamon roll. So gooey and good and perfect for sharing with multiple people ($5 for the roll). We would usually do this option for dinner and sit outside after the sun had gone down to enjoy a little break before hitting Fantasyland! Our favorite spot to grab a burger used to be Pecos Bill Tall Tale Cafe, we enjoyed the atmosphere better and would make it our "go-to spot" before hitting my personal favorite, Splash Mountain. However, Peco Bill now serves tex-mex, which we will have to go back and try, but haven't made it since they changed. However, Cosmic Ray's offers similar burger options. We would usually split the burger (huge) and fries. We would load up our half of the burger to our liking at the free condiment bar (onions, mushrooms, all the fixings) and chow down. This would usually be a lunch option before a bigger dinner and comes out to about $8 per person. While probably our least favorite of all these options this would be a quick and easy go to and sometimes, well, you just want a burger after a long morning trekking around the park. Columbia Harbor House Seafood Mac and Cheese!! Cheese, glorious cheese!! I love me some mac and cheese!! Add in lobster and I am in heaven!! Seriously, this stuff makes me happy and while it isn't super Babe approved (he is not a mac and cheese fan), he still enjoys it too. It is also really rich, which to us makes it super filling, so we can share one no problem. It may look smaller, but trust me, it hits the spot perfectly for two people! It is a little more expensive than the others, coming out at about $7 per person if you are splitting, but I mean lobster!! Lobster and cheese and happiness for $7? It can't be beat! We would eat it, sit a minute and then hit the Haunted Mansion for a slow, easy ride while the cheese digested!! I realize that these are all share options, but coming from two people who love their food (and one who will get real hangry if she doesn't eat enough), you definitely get enough to satisfy! And for those of you looking to explore Epcot and The Food and Wine options, here are some of my favorites dines from last year! Oh, miss it! I miss it!! Have a gloriously, magical day! 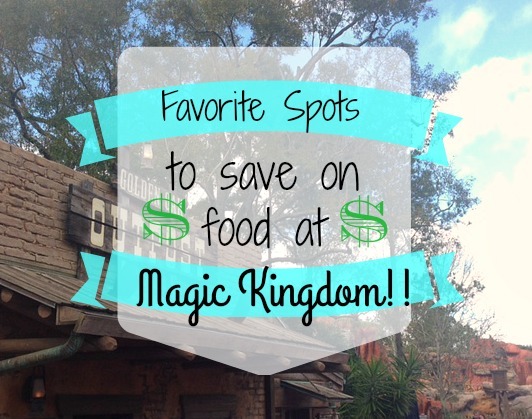 Any tips or tricks of your own for saving on food at the park? Share in the comments, I would love to know your secrets! Thanks so much for linking up with the Alder Collective! Love these tips!